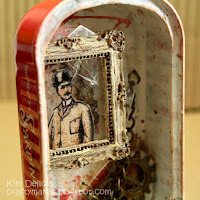 Have you spotted my DIY Tin Can Overhaul tutorial on Blitsy? 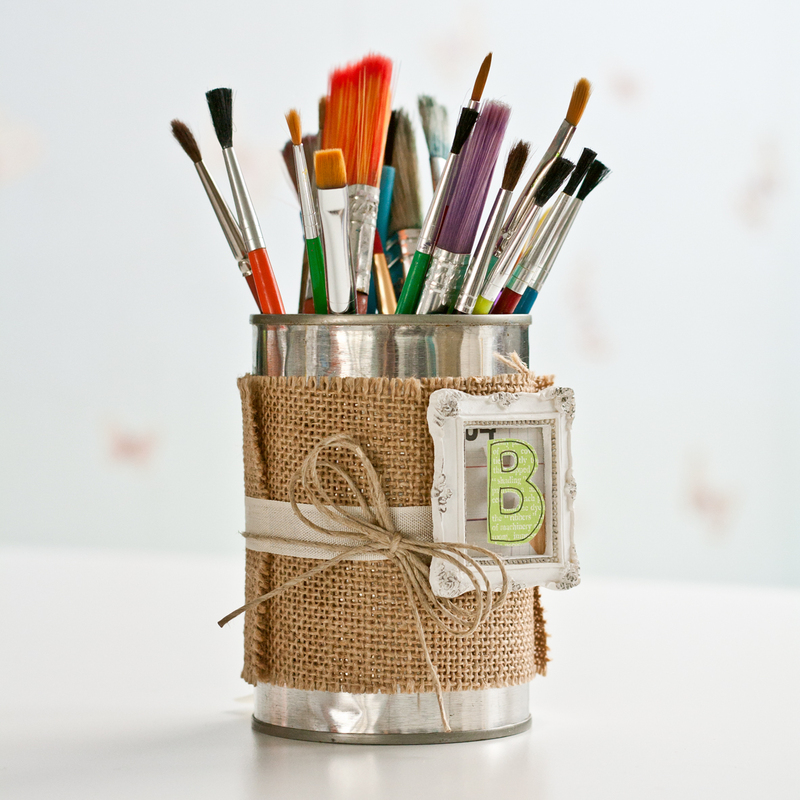 A bit of recycling to help with your craft stash storage! Is it me or are the brushes I’ve got in there just way too clean? Hope you fun with your own DIY Tin Can Overhauls! 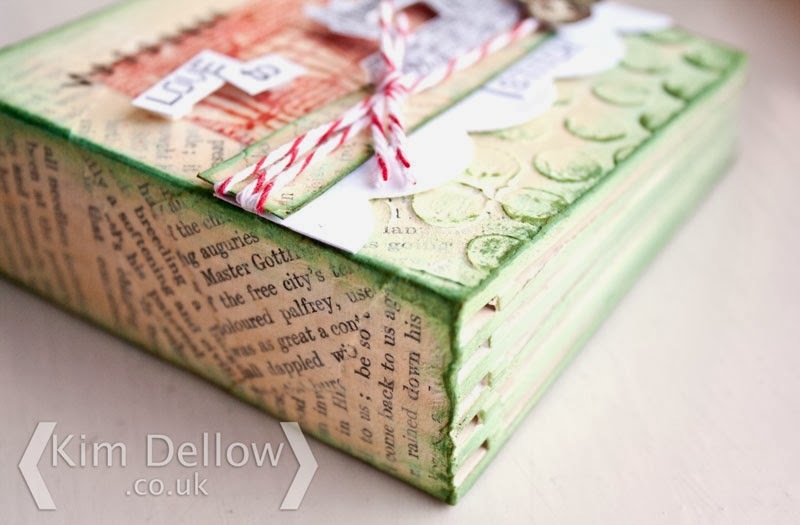 I do have a tutorial for you, it was up on the Blitsy blog on Cyber Monday. 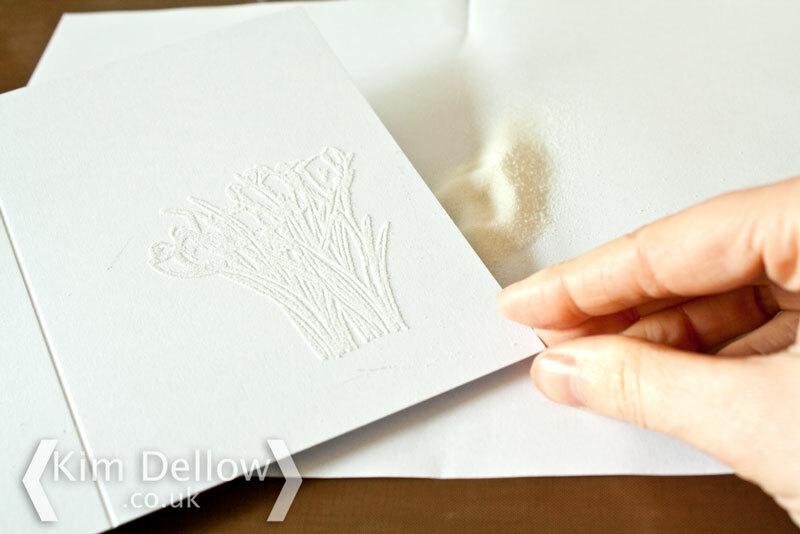 The idea behind this tutorial is a bit of inspiration for some super-simple last minute Christmas cards that you can mass produce if you need to. So, go on, what bargains did you get, spill…? 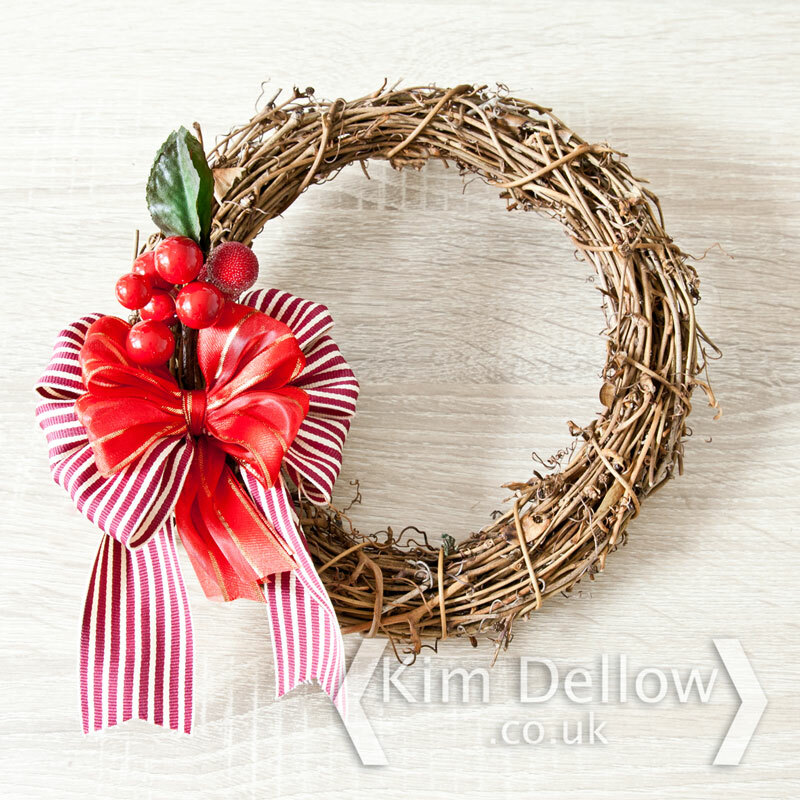 Did you see my Christmas wreath with the big Bow-it-All bow on Wednesday? Did you fancy a tutorial to go with that make? Hope the answer is yes, because here it is! The Zutter Bow-it-All is available in the Blitsy Black Friday sale* so you might want to catch it at its bargain price and they ship worldwide – just saying! Set up the Bow-it-All to make a 4 inch wide double bow by placing the pegs in the 3 inch and 7 inch holes on the middle row and the 3 inch and 6 inch holes on the bottom row. 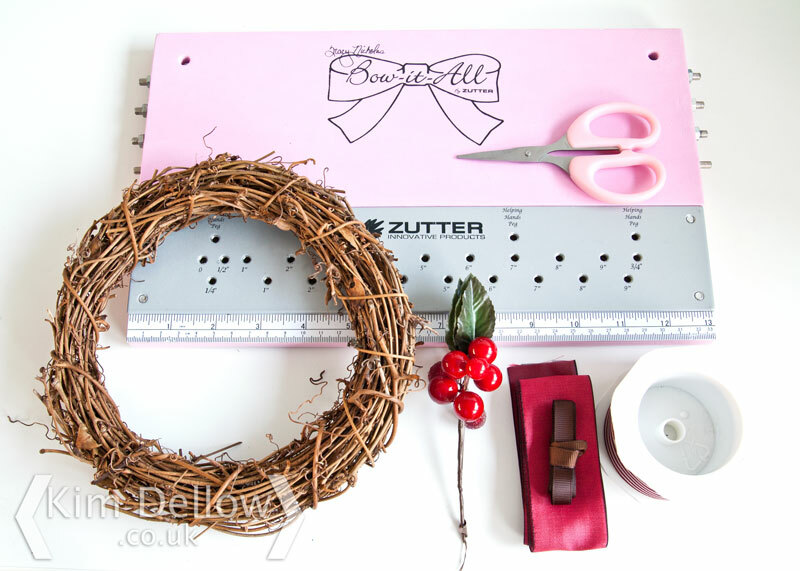 I also wanted to add a piece of ribbon to tie the bow onto the wreath so used the outer ‘Helping Hands Peg’ holes. 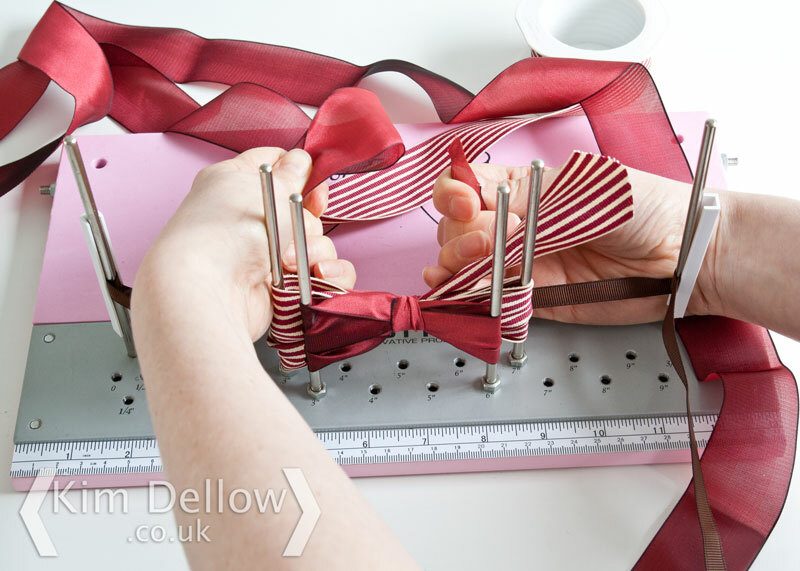 Wrap the thin brown ribbon around the helping hands pegs and clamp the ribbon in place with the helping hand clips. Cut an arrow point into the tail end of the bow ribbon (the end to the ribbon on the left of the picture above) so that you can easily keep track of it when you are tying off at the end. Now start wrapping the working end of the ribbon (the bit that isn’t arrow-cut, and may still be attached to the spool) around the two middle row pegs in a figure of eight. I wrapped the ribbon around three times. Once you have the number of loops you want it is time to tie the bow. Now this is where it gets hard to explain in writing and if you get stuck go check out one of the videos on YouTube. a. Take the working end of the ribbon to the back with your right hand then wrap the tail / arrow-cut end forward, over the top of the loops, through the middle of the two pegs with your left hand. Then pass the tail / arrow-cut end under the ribbon wrapped around the pegs and through to the back again. b. At the back swap hands, so that the tail/ arrow-cut end is now in your right hand and the working end is in your left hand (told you this was hard to explain in writing didn’t I?). c. Now make a loop with the working end ribbon in your left hand and wrap the tail / arrow-cut end over the top of the working end, round, under and through to make a knot. 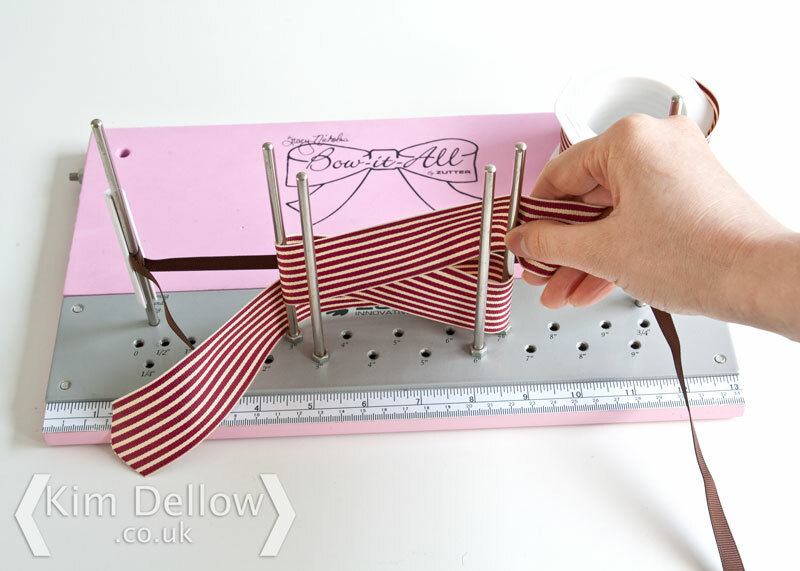 d. Swap hands again so that the working end is back in your right hand and the tail / arrow-cut end is in your left hand and pull the ribbon ends to tie the knot. Check you are happy with the way the front looks before pulling the knot fully tight. Yeah, not so easy to describe but super easy to do once you have the hang of it, honest! Now repeat but this time use the front two pegs. This time when you come to tie the infamous bow knot make sure that you wrap the tail / arrow-cut end around the first bow you made, sitting on the back pegs, and the placement ribbon that has been minding its own business between the helping hands pegs too. Tie the knot as tight as you can, it helps to scrunch up the loops and pull alternatively left and right on the two ribbon ends. Then cut the ends of the ribbons. Once you have finished you just pull the bow off the pegs, turn it the other way up, you have been looking at it from the front but upside down when it was on the pegs, and fluff out the loops to how you want them. 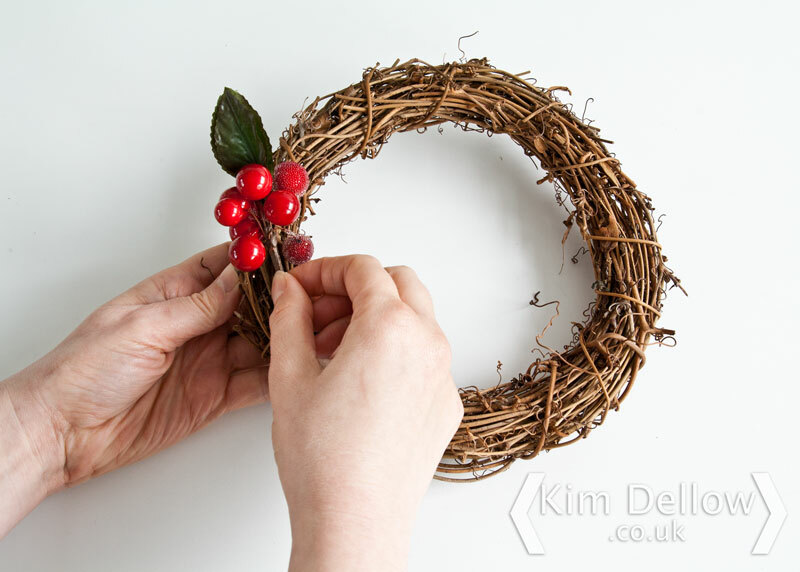 Stick your berries of choice into the rattan wreath, if the berries are on a wire they should fit nicely between the pieces of rattan. If not you may have to use a glue or tie the berries on. 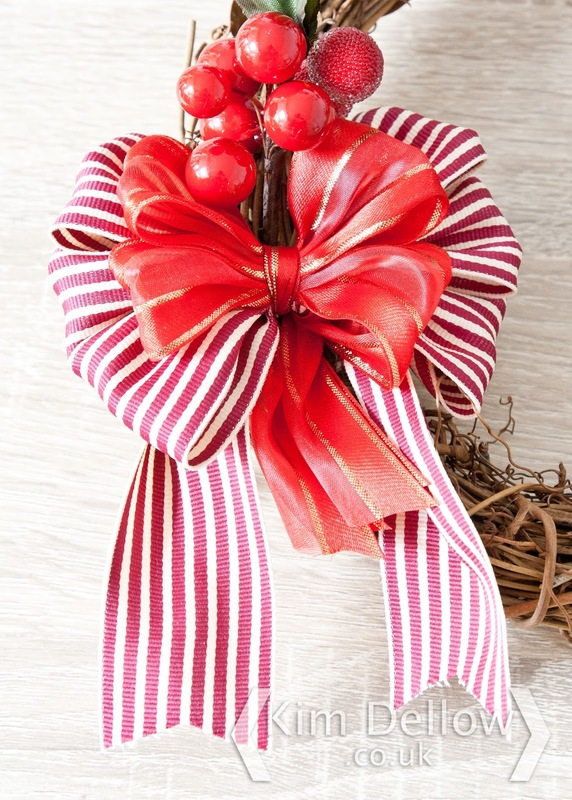 Now turn the wreath over and use the brown piece of ribbon on your bow to tie it to the wreath. How simple is that? Well that is another Christmas decoration done! I’ve made a grand total of two Christmas decorations now. Yay! I’m on my way. If you are tempted by the Bow-it-all don’t forget to go check out the Blitsy Black Friday sale. Who fancies something cheerful and bright? ME! ME! ME! 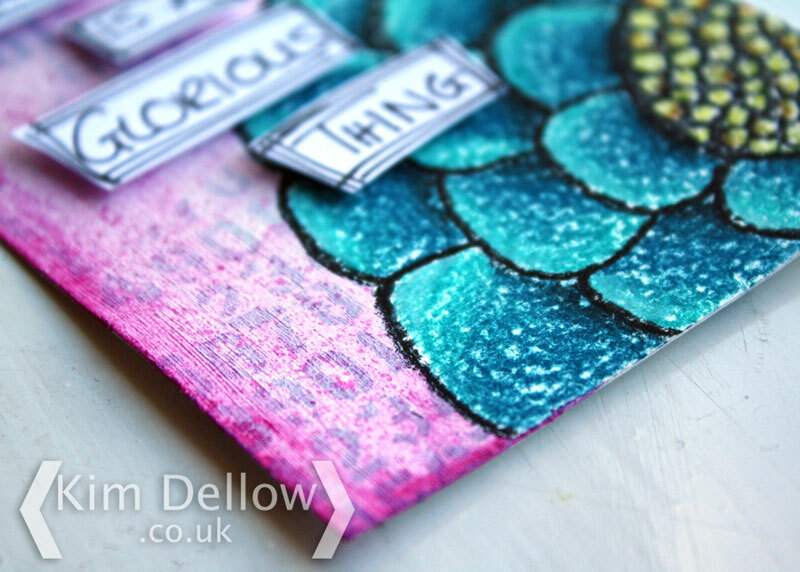 Yep, I thought that today would be a good day to share a big, colourful bloom tag tutorial using watercolour and pastel pencils. What do you reckon? Are you up for it too? 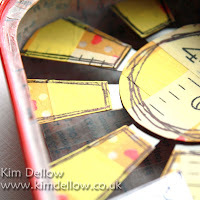 It is a project revisit and you may have seen it on the Faber-Castell Design Memory Craft in 2012 but it is new to my blog so I hope you enjoy it and have a go at it yourself. Prepare the surface with a layer of gesso then once the gesso is dry lightly draw the outline of a large bloom on the bottom right hand corner. 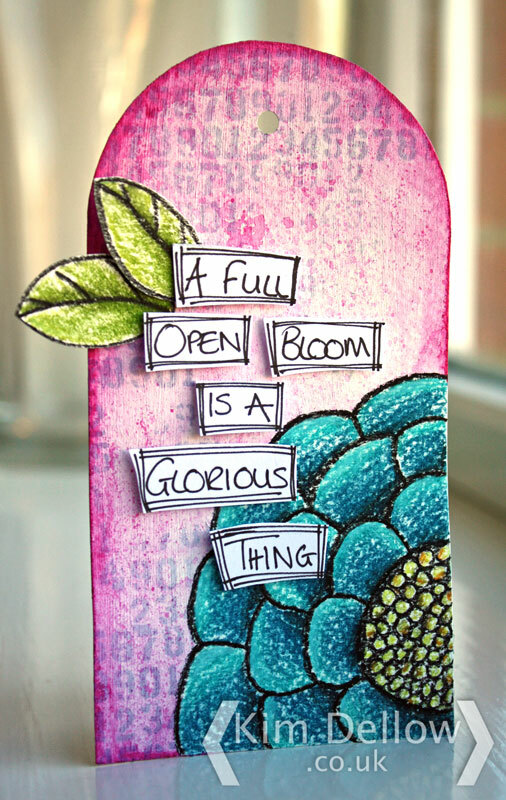 Fill the bloom shape with Masking Fluid* and let that dry. 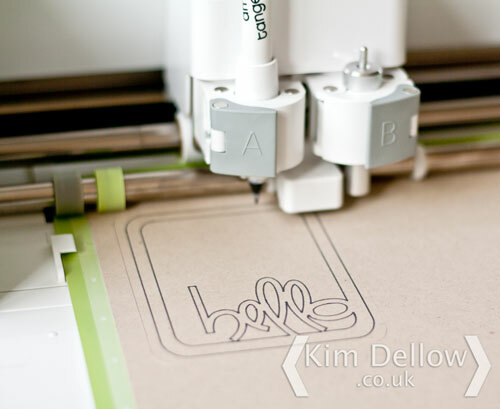 Use the texture stamp and the Ranger Archival ink to stamp in random places. Then start adding colour using the Watercolour pencils* by picking up the colour with a wet brush from the pencil point and brushing it over the surface. 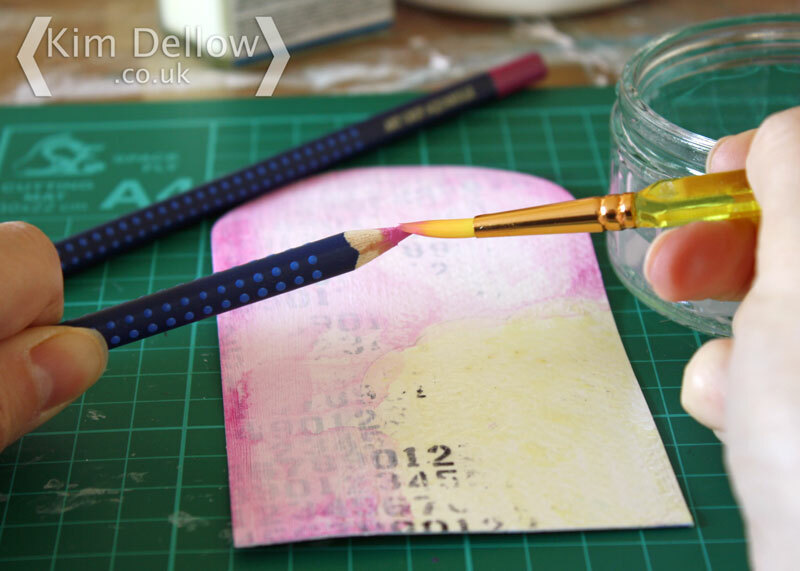 Keep adding colour with the wet brush to get the intensity that you want then run the pencil point along the outer edge of the tag. 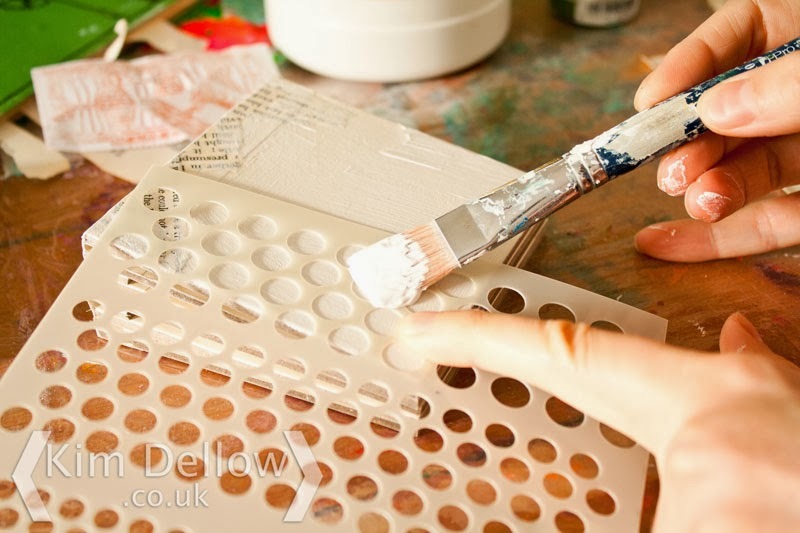 Use the brush to soften any edges as needed then let the tag dry completely. 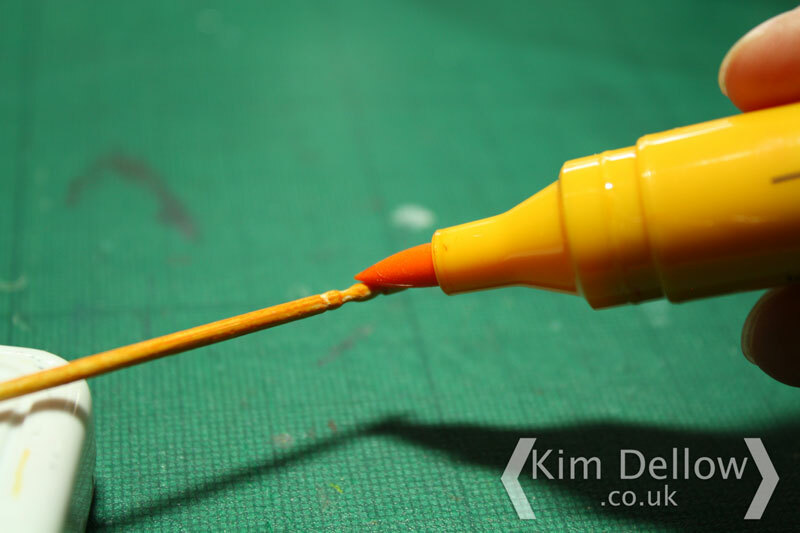 Load the wet brush with colour then flick the tip to get a colour splatter on the surface. 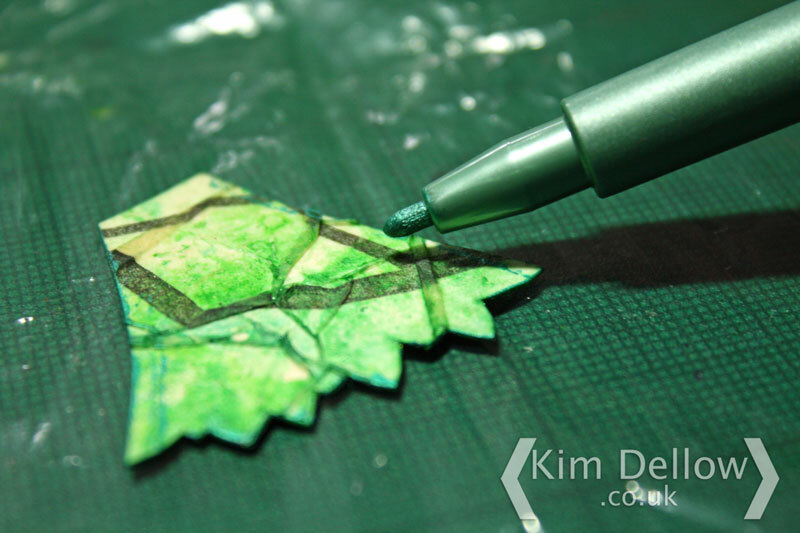 Once the surface is dry peel off the Masking Fluid*. In the space left by the Masking Fluid* draw in the big bloom with a black PITT® Pastel pencils*. You may want to redraw the bloom in lightly with a pencil first to give you some guidelines for the pastel outline. 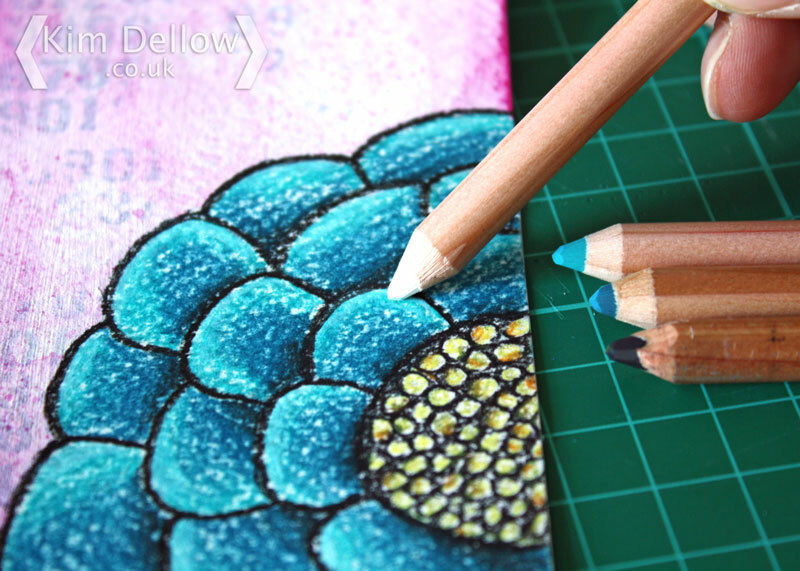 Start adding colour to the petals by using different tones of your chosen colour of Pastel pencil*; try using the darker tones nearer the centre and bottom of the petal and the lighter tones around the edges. Add some extra highlights and blending with a white Pastel pencil*. Finish the tag with a hand written sentiment cut out and lined with the black Artist Pen* and some hand drawn Pastel pencil* leaves. There you have it, a bright, bold, bloom tag! with lots of lovely layers and textures. I think these techniques would look lovely on a canvas or a journal page, what do you think? Thanks for dropping by for my revisited tutorial today. Oh yeah it is Sharing Friday. Yep, you know it is Friday so it must be *Sharing Time*! What will you be up to this weekend? Ok, let’s ignore what I will be up to as it will be mostly cleaning *boo*. But what about you? 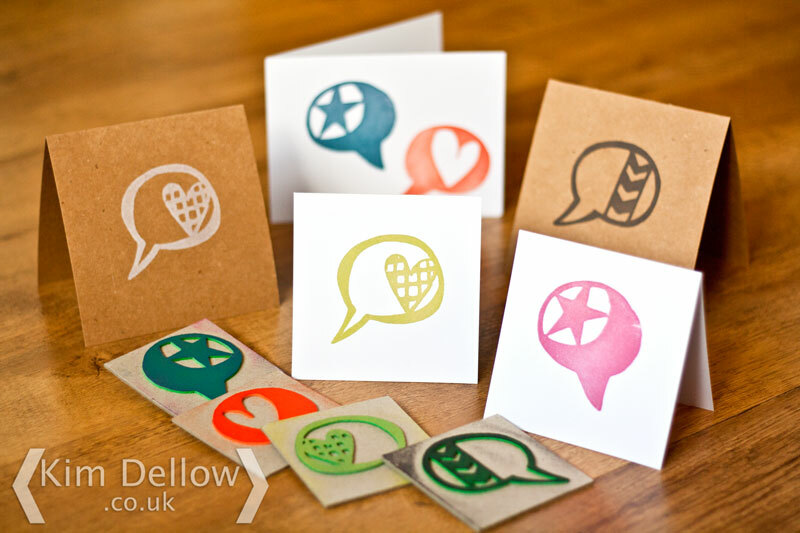 Got any crafty or arty plans for the weekend? You know I love looking at blogs for some inspiration, I know you do too and it suddenly hit me, myself and the other designers with Practical Publishing International Limited have loads of free projects over at the Papercraft Magazine website and even though I always share them on my Pinterest, Facebook, Twitter I haven’t really shared them on my blog much! D’oh! Seems obviously really. Me slow on uptake! 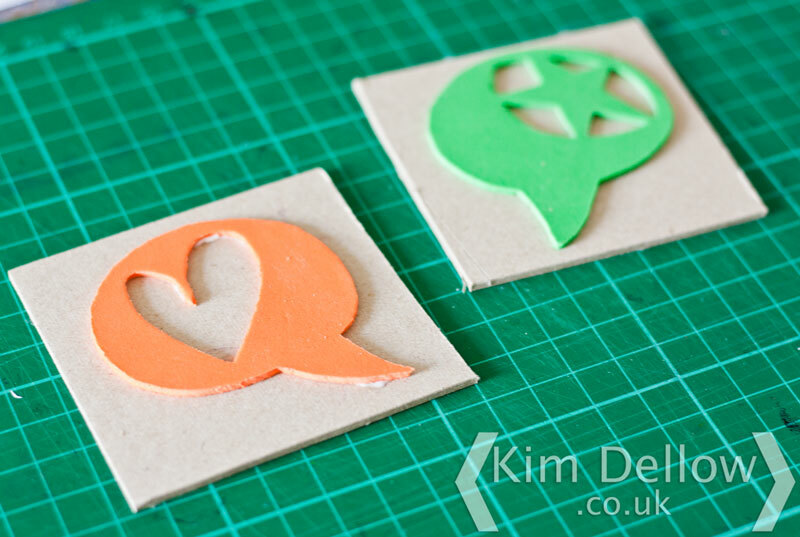 So if you are looking for some weekend crafting inspiration how about these two for starters? Both of them are mine but other designers are available! For all you happy snappers (yep, I’m looking at you!) 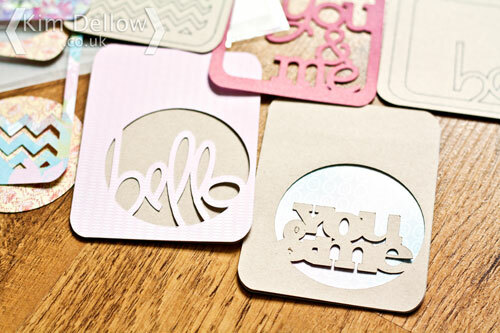 check out my bonus make with step by steps for Simply Cards and Papercraft issue 128 on the website. I want all those cameras in the background of that photo! In the magazine there is even more inspiration for making the most out of those gorgeous pics you take of random things when you are out and about. But are you ready for Christmas yet? Are YOU ready for CHRISTMAS? Argghhh! I mean it is only erm, so many days (someone count the days, I can’t do it), I mean not many days at all, really, if you think about it. It’s practically Winter already. Admittedly a warm Autumnal Winter, but blink and it will be Christmas Eve, so get yourself ready now with my Seasonal Table Décor ideas in Papercraft Essentials issue 112. How about this Cracker of an idea (get it? Cracker? Sheesh, lucky I don’t earn my living by trying to engage an audience in a fun and interesting way on a blog or something isn’t it? Mmm?! Oh dear, beans on toast again! What do you mean we can’t afford the bread?). 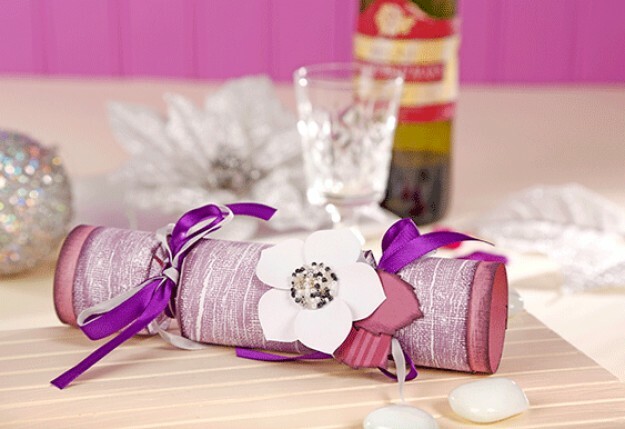 The template for the cracker and the Winter Rose are on the Papercraft Magazine website free to download. So what will you be doing this weekend? Do let me know and if you want to share the results with me do link-up or leave a comment. I’m having lots of fun with Instagram at the moment so come and say hi if you are on it! You are ok, my rubbish jokes and I are going now, you can go about your business. Are you ready for another DIY tutorial using the Cricut Explore? 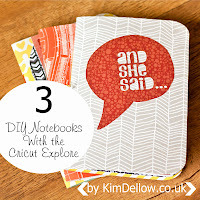 Great ‘coz I’m ready too and this week I’ve been making DIY notebooks and journals using the Cricut Explore. 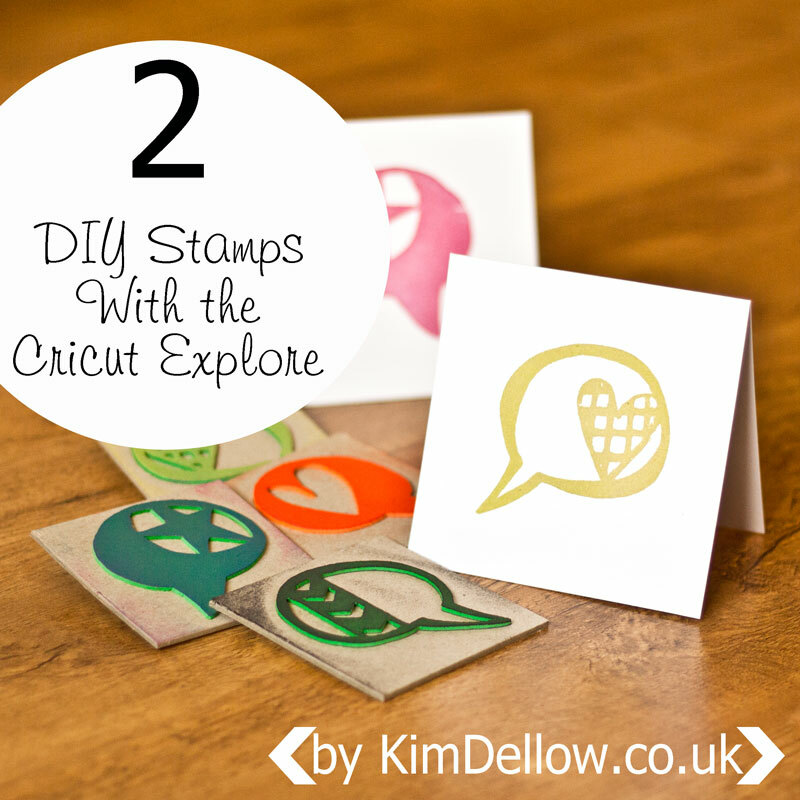 But before I show you how, you might want to catch up with my other How-Tos with the Cricut Explore this month so check out my Journaling cards and the Stamps tutorials for more DIY fun. 1. 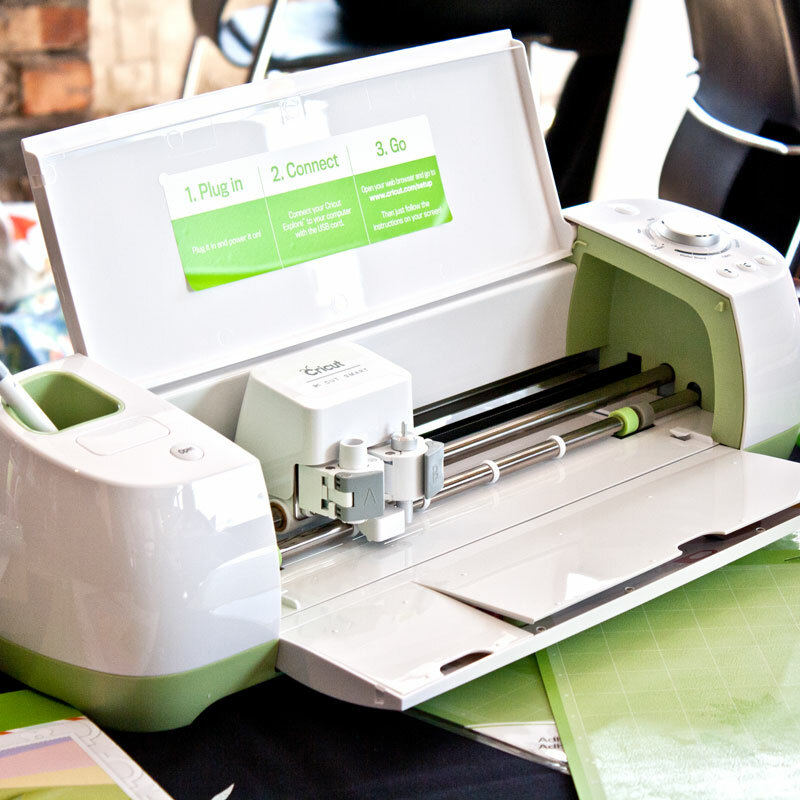 Open up the Cricut Design Space software and start a new project. Insert a square with rounded corners, I’ve used #M46C02 and ungrouped the layers then made the bottom layer visible and deleted it. Resize the square to make your notebook cover, I want a 5 inch x 7 inch notebook so I made the square 10 inch x 7 inch. 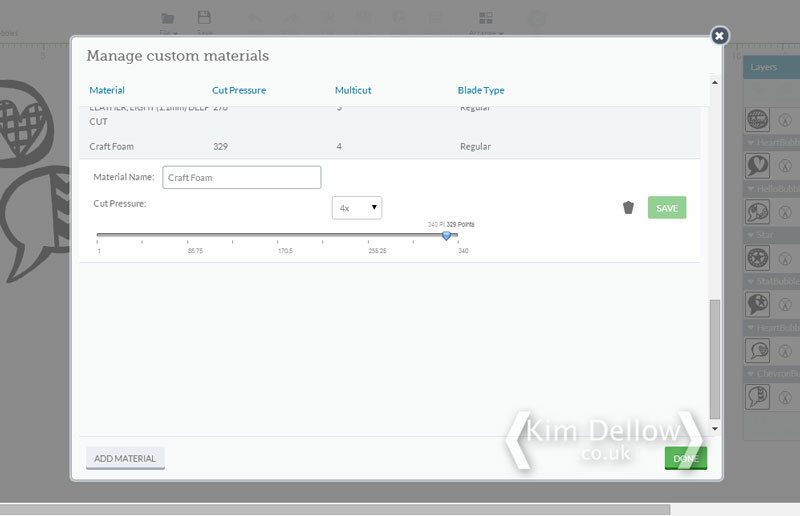 Use the numbers in the box when you pull the corner to help you size the shape or use the ‘Size’ option in the ‘Edit’ window. 2. There is a rather handy free score line if you search for #M48E16, I found it using the keyword ‘line’ in the search box. Insert the score line and resize it to fit the height of your notebook. Now here is the tricky bit. 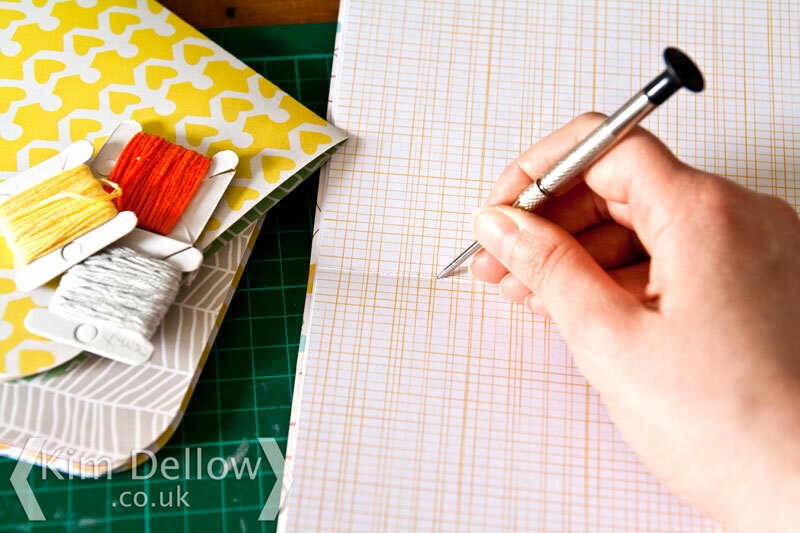 There are no centering or alignment tools in Cricut Design Space (or at least I’ve not found them) so you need to do a bit of jiggery pokery (official crafting term) to get the fold line in the centre of the notebook cover. 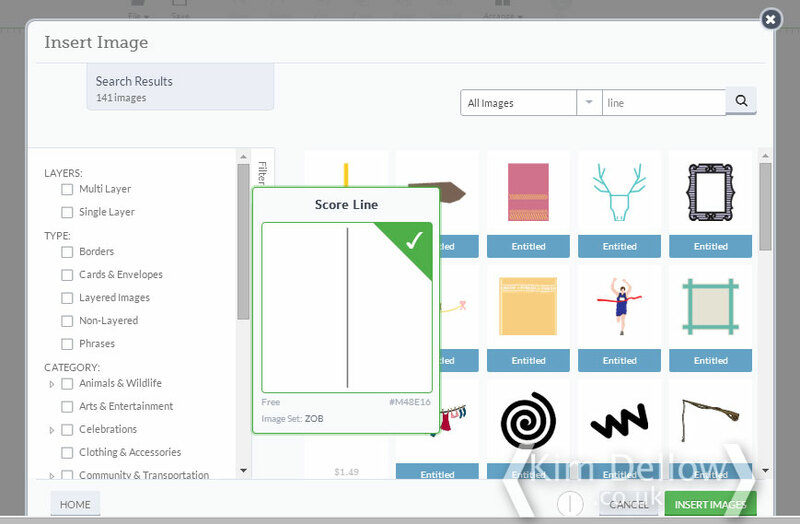 The easiest way I found was to move the notebook cover shape so that it is up against the ruler on the left-hand side then select the score line and move it left or right, as needed, with your mouse. As you move it a box will tell you where the line is on the workspace so use this to place the line exactly halfway on your notebook cover, so for my case when the X coordinate hits 5 inch. Alternatively use the ‘Position’ option in the ‘Edit’ window and change the X coordinate directly. If there is an easier method please do let me know! 3. My next step is a lazy step and you can skip this one if you like and go straight to step 4. 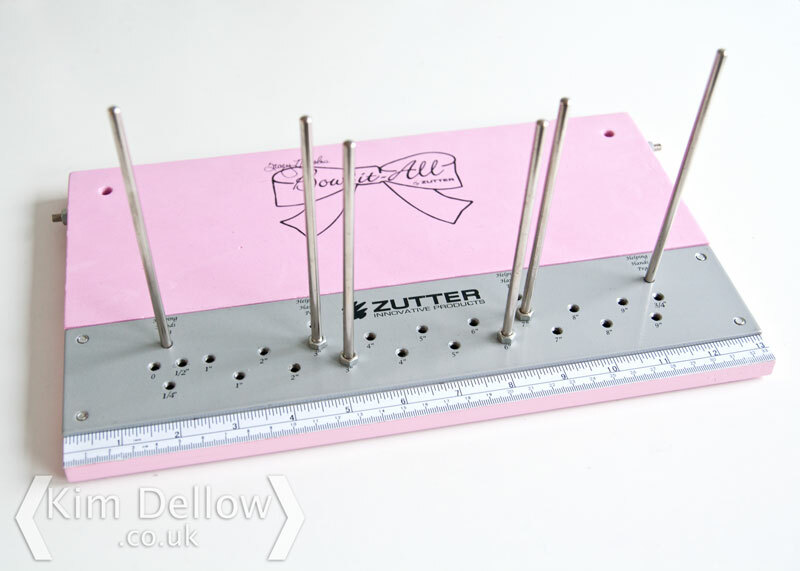 For my lazy step I decided I wanted the machine to ‘tell’ me where to place my holes to bind my book, so I inserted another score line, turned it 90 degrees and decreased its size until it was just a long dot. I then copied and pasted it and placed both notches along my centre score line in the positions that I wanted to stab my holes. You might need to use the zoom to help you do all this. These little notches become very hard to see so once you have them in place group them together to make them easier to move around. 4. 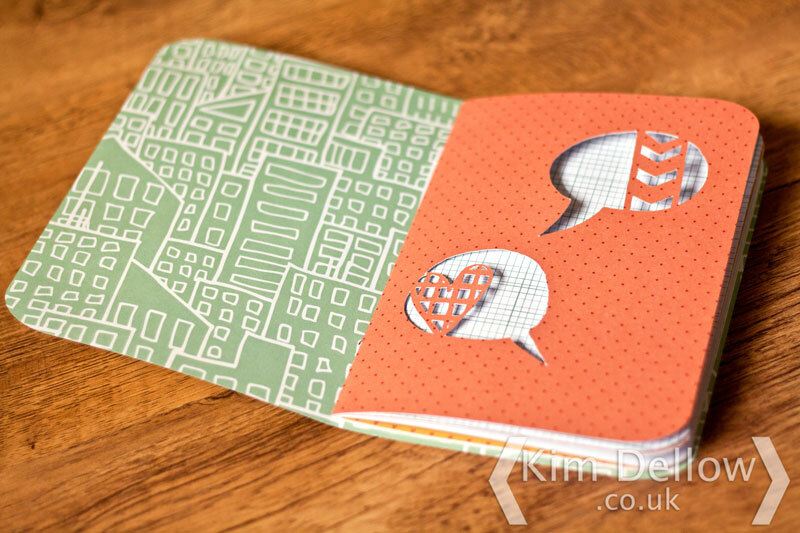 Now that you have your cover, how about some inside papers for your notebook? For your basic inner pages copy and paste the cover page then resize the copy to be slightly smaller than the cover, I went for 9.81 inch x 6.81 inch. You are going to need to re-size and re-centre your score line, just do what you did for the cover, but take into account the change in size. Tip – if you used the notches trick from Step 3 to help you with the placing of your holes when you come to bind the book then make sure the cover notches are grouped together then copy and paste them. Place them so that the top one is the same distance from the top of the page as the bottom one is from the bottom of the page, but make sure you don’t resize them. This means that the holes in the inside pages will be in the same position as they are on the cover even though the cover is bigger than the internal pages. I hope that makes sense. 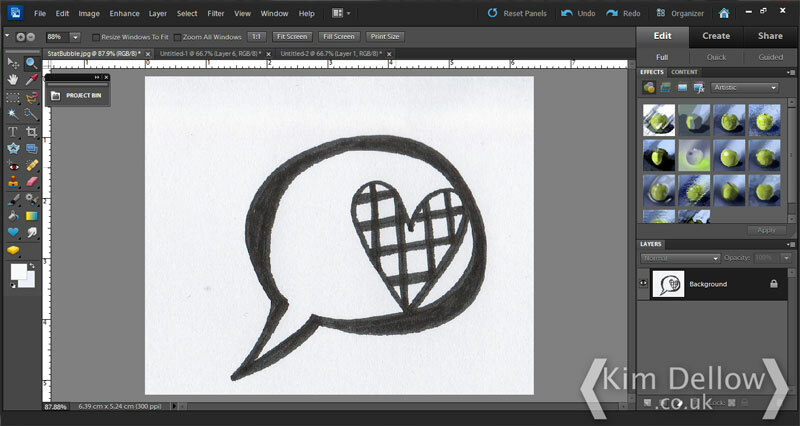 You can now add some cut-out shapes to your internal pages to make them even more funky! 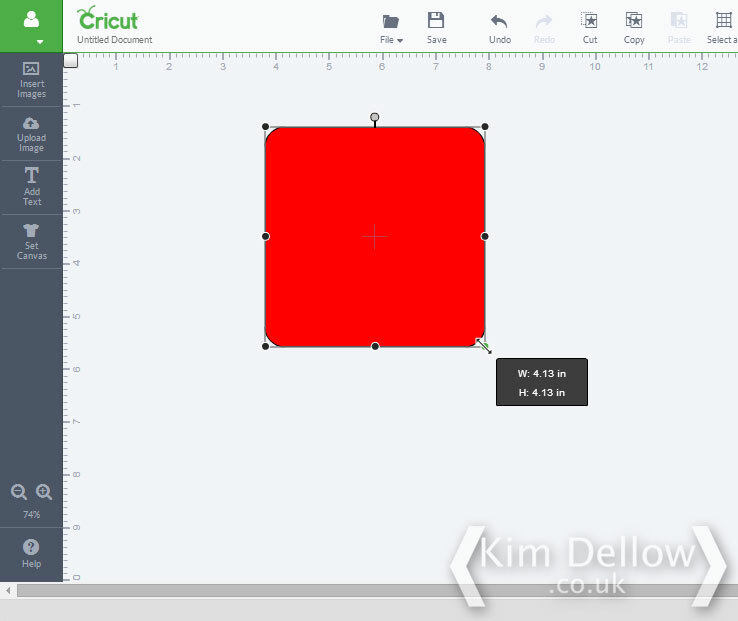 Insert an image or two and use the ‘Contour’ button in the ‘Layers’ Window to remove any lines you don’t want to cut by clicking on them to ‘turn them off’, then click ‘Contour’ again and select the image and the page layer and ‘Weld’ them together by clicking the ‘Weld’ option in the ‘Layers’ window or use ‘Weld’ in the right mouse button drop down list. 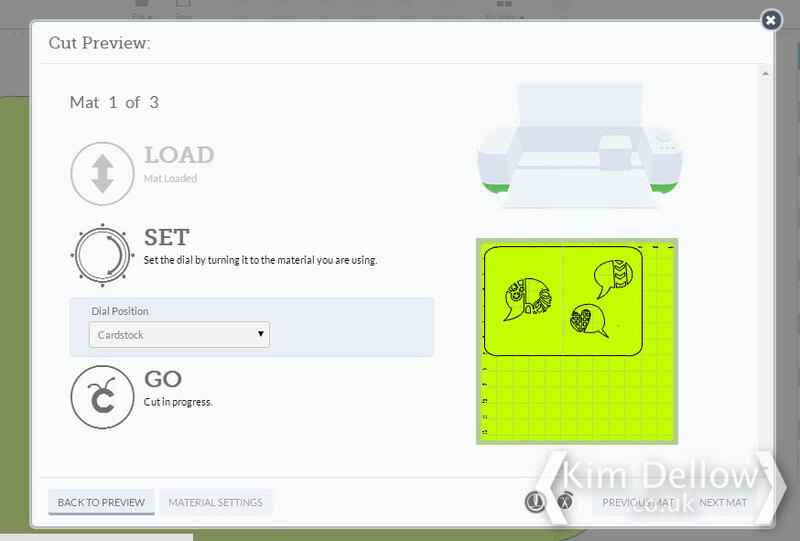 Troubleshooting – if you press the ‘Go’ button but the ‘Mat Preview’ window doesn’t load properly and just hangs. You might also spot an orange message appearing underneath it saying ‘Global Flex Error’ (nicely hidden, so you might have to move the window down to see it). Try going back to your project workspace and making any hidden layers that you don’t want visible, ungroup them and delete them. 5. To cut out and score your notebook pages and covers don’t forget to select your cover or page shape, the centre score line and any notches you have made and attach them together before pressing ‘Go’ then follow the instructions to cut and score. Remember also to put your score tool into clamp ‘A’ on the machine! 6. Once you have cut your cover and pages fold them and place them inside one another, then line up the internal pages with the cover page and punch a hole where the notches indicated, or if you didn’t use the notches trick use a ruler to help place the holes. 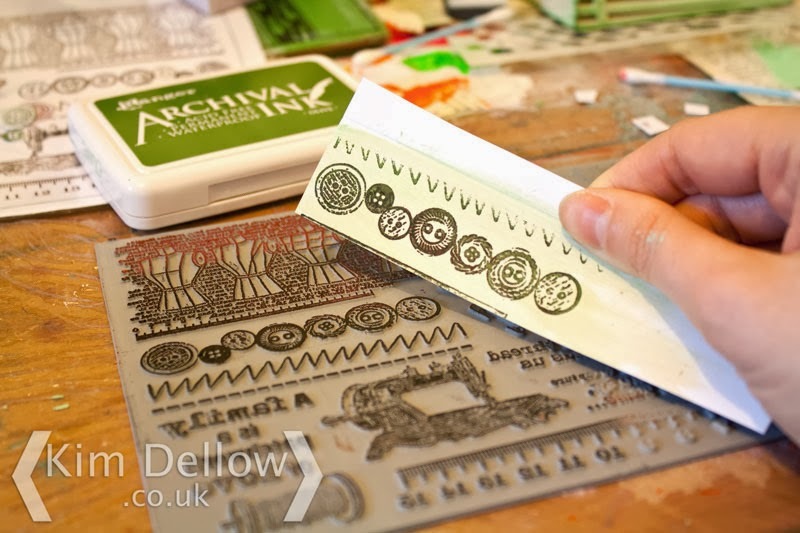 Tip – If you are using a thicker paper or card you might need to punch the holes individually on a couple of pages at a time and then put them together and align the holes. 7. Use a needle and thread to thread through the holes and then tie a slip knot. 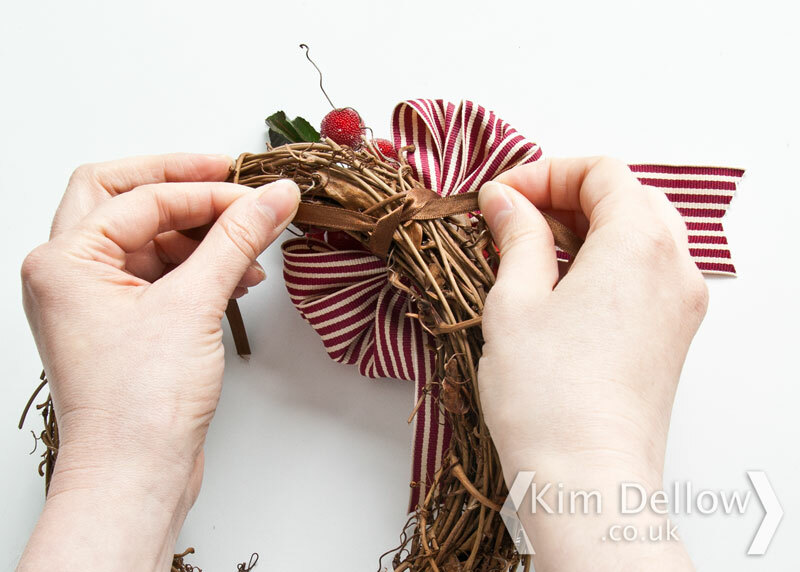 Tighten the slip knot as much as you can and then tie the two ends together with a permanent knot. Trim the threads as needed, I kept mine quite long. I also tied my knots on the outside of the books as I like the look, but you can always tie them on the inside of your book to hide them. Now all you need to do is decorate the cover and start using them! Do you recognise these cut-outs? 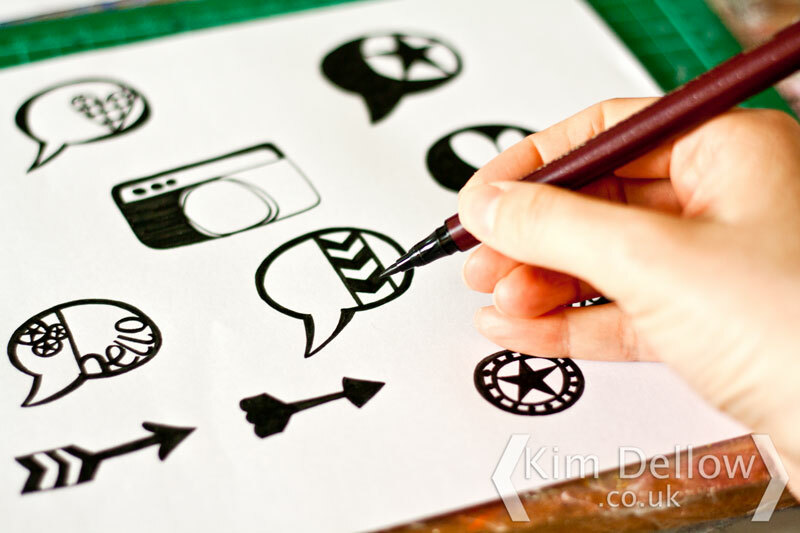 They are die-cut files I made from my doodles and I show you how in my DIY Stamp making tutorial. Regular readers of my blog will know that I am a bit of a notebook and journal fanatic, so these are a great addition to my ever growing collection! Now I just need to decide what to put in them! What about you? 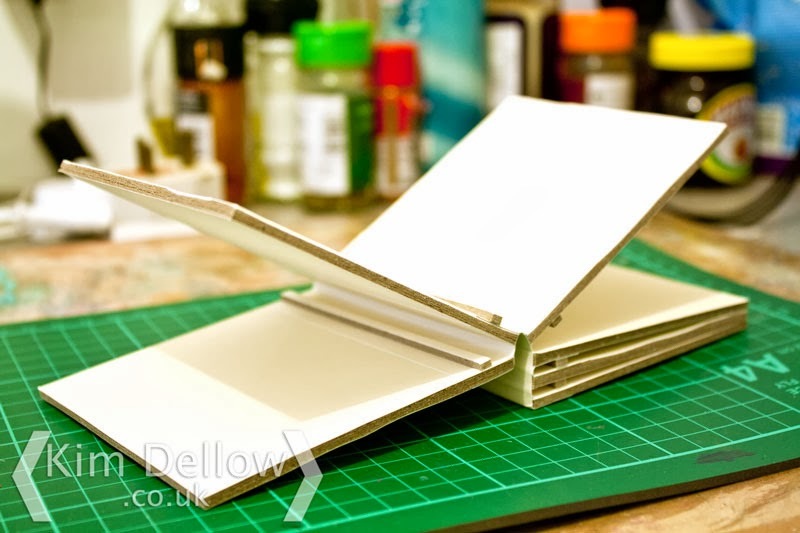 What use would you like to make a notebook for? Putting up our Christmas decorations this weekend I came across a project that I did last year for Faber-Castell Design Memory Craft. Some of you might remember it, I had a step by step tutorial for it too but the tutorial only went up on the Design Memory Craft blog and I thought it might be fun to post it here on my blog. 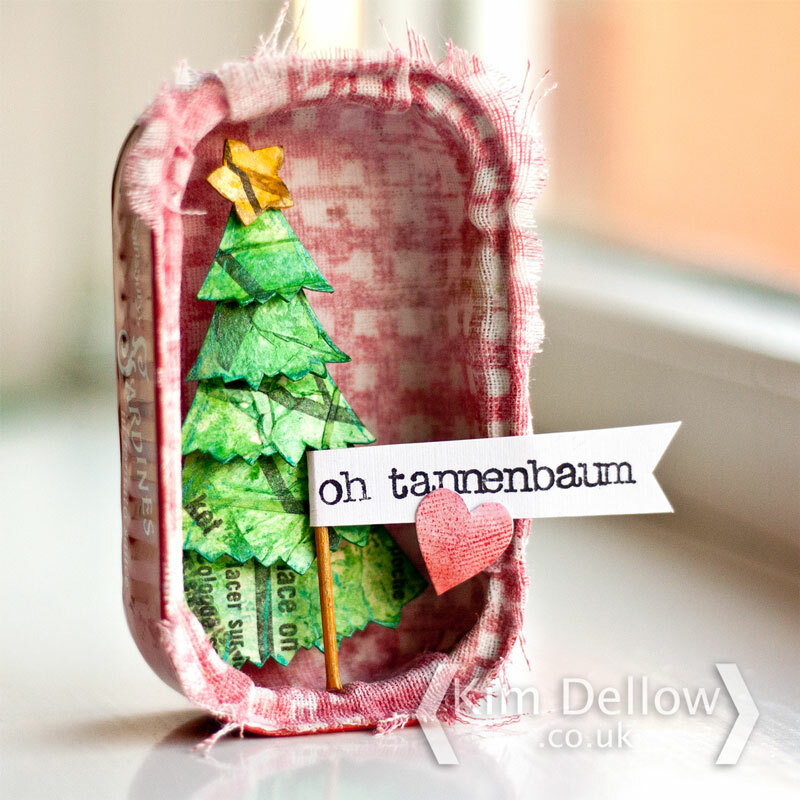 I’ve added some more details to the tutorial here but if you want to see the original post then pop on over to the Design Memory Craft 2012 12 Days of Christmas, Day 5: Christmas in a Sardine Tin. 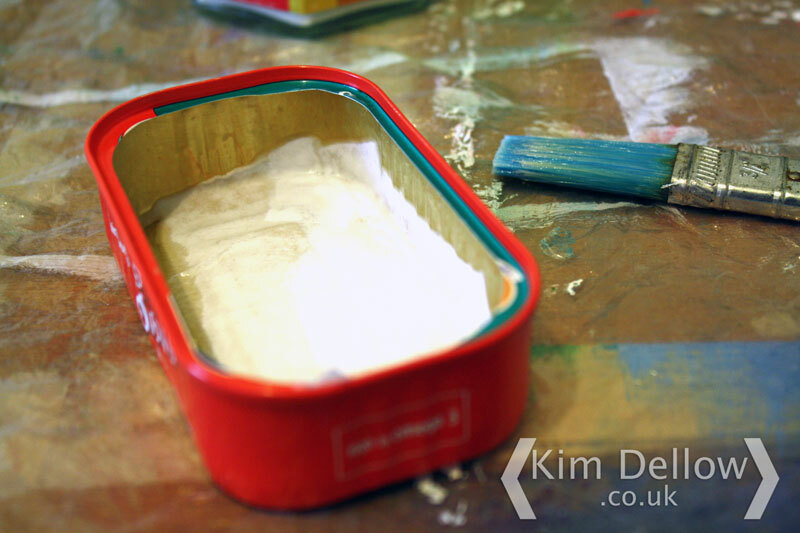 Sardine Tin – empty and clean! So you have eaten the sardines, or feed them to your cat, cleaned the tin and dried it, now you need to prepare the inside ready to stick on the fabric. 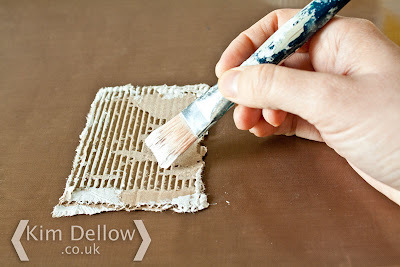 Either cover it with gesso or use a sturdy multi-purpose glue to stick on some white paper and let it dry completely before starting the next stage. 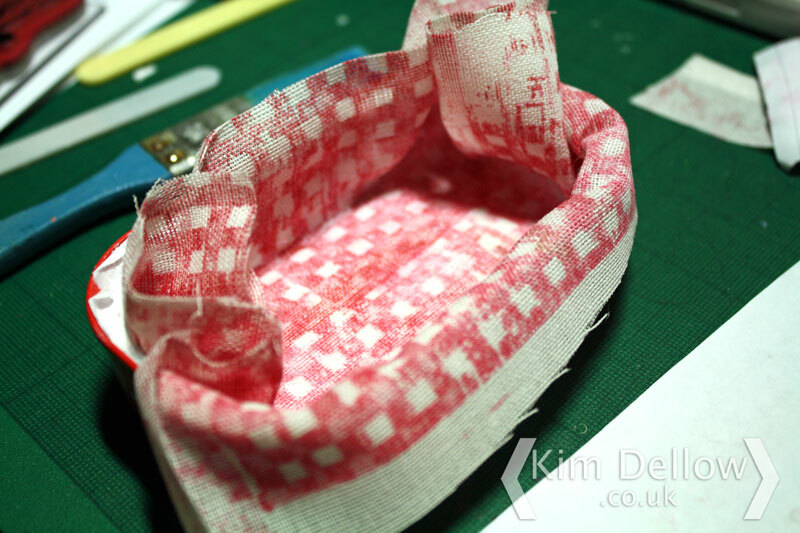 You can use any fabric you might already have and if you have a nice patterned fabric already then trim it so that it is bigger then the tin then move on to Step 3. I decided to use a blank loose weave canvas type fabric and decorate it myself. 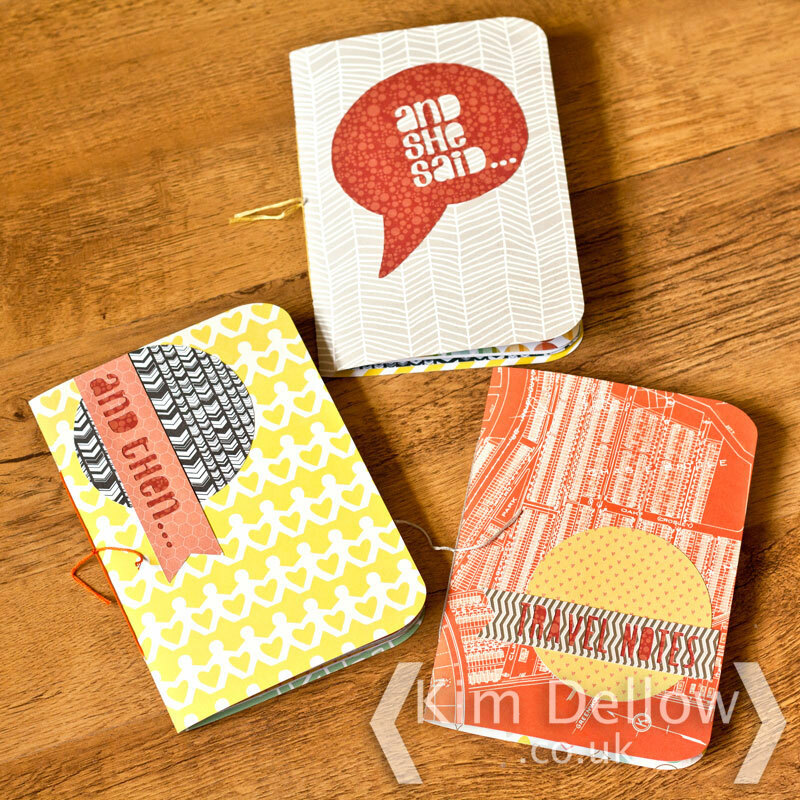 I stamped a pattern on it using the Gelatos and Stamper’s Big Brush pen. 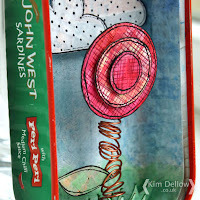 Paint the inside of the sardine tin with glue and start pressing the fabric into the tin. Smooch the frabic up into each of the corners and take your time covering all the walls. 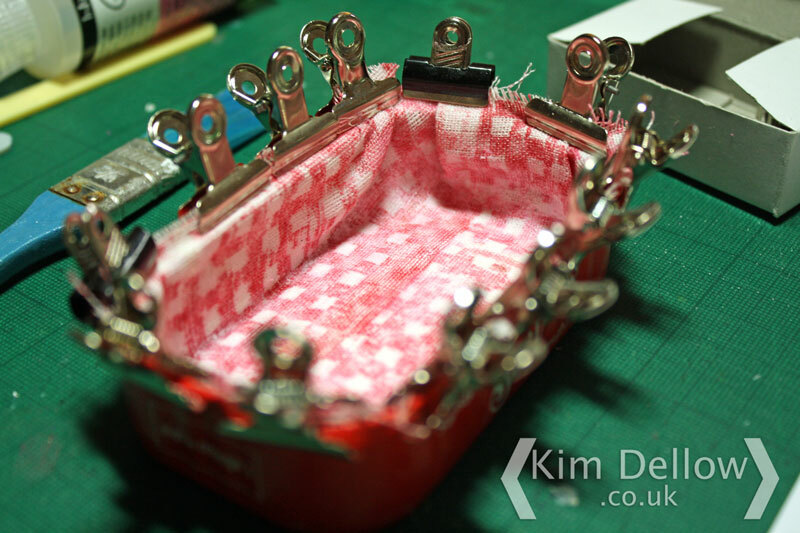 Bulldog clips or clothes pegs come in handy holding the fabric in place whilst the glue dries. You can add a bit of sparkle too with a metallic pen like the PITT Metallic Green 294 Artist Pen, I’ve skimmed it over the edges and along any folds in the papers. Make a little star using the same method then round the tree over a pen and stick it in the tin. 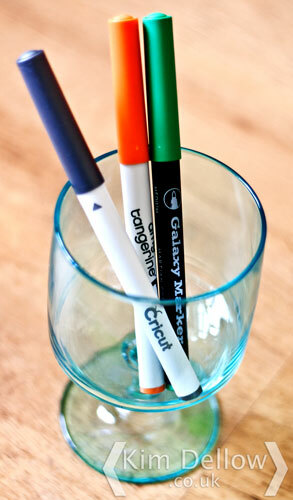 Stamp or write your sentiment and colour a cocktail stick. Wrap the sentiment strip around the cocktail stick and glue it into the tin. 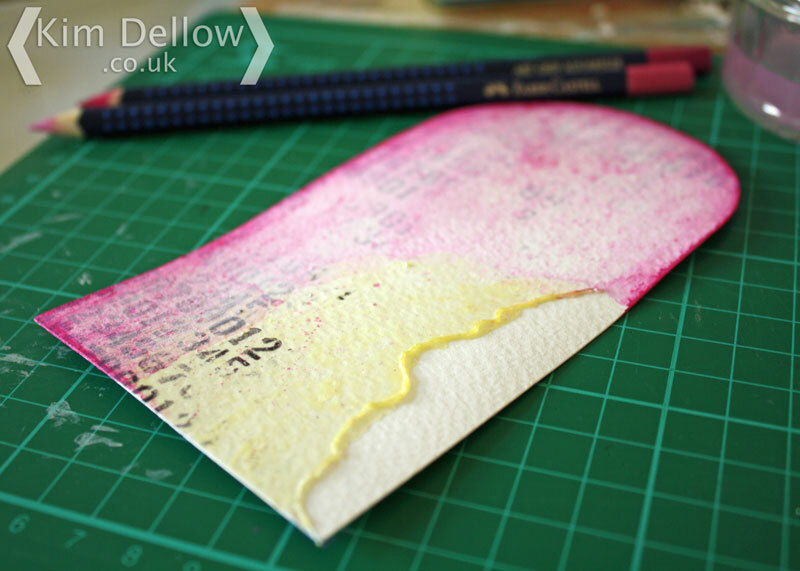 Then make a little heart cut from coloured card to finish the make. Hope you enjoyed this project revisit. 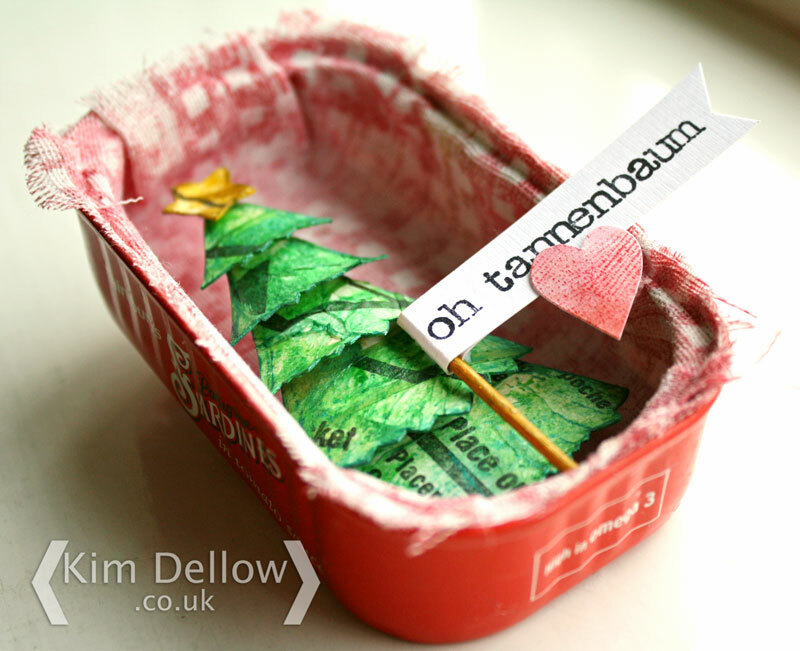 Now I’m wondering what other Christmas scenes I could put in a tin, what do you think? 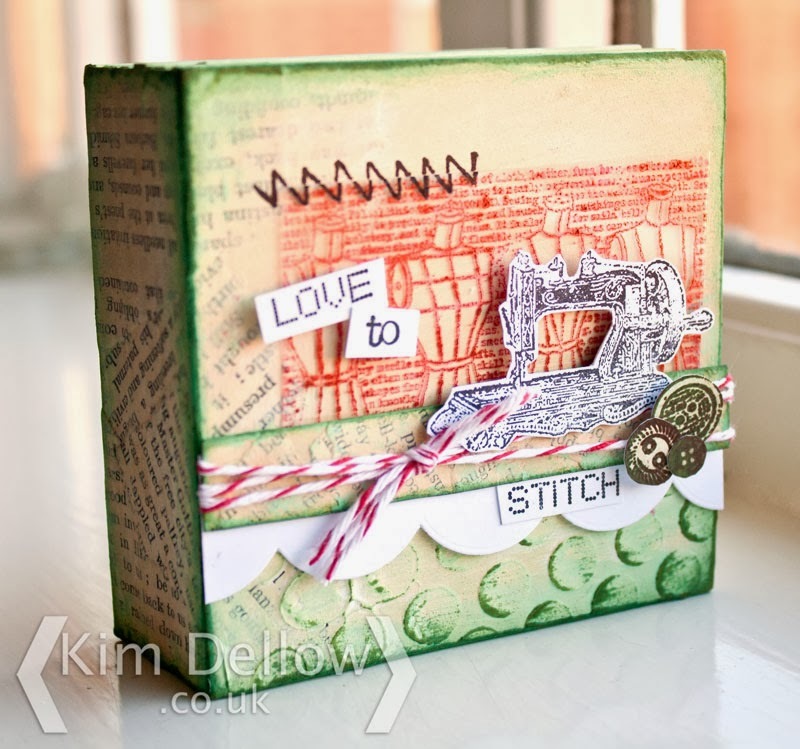 Hey up lovely folks, so yesterday I posted a make for Creative Expressions and it is your lucky day ‘coz I have another one to share with you today to finish off the November DT makes using the Umount Winter Flower stamp set. It’s an ATC and I wanted to share with you the making of this one. 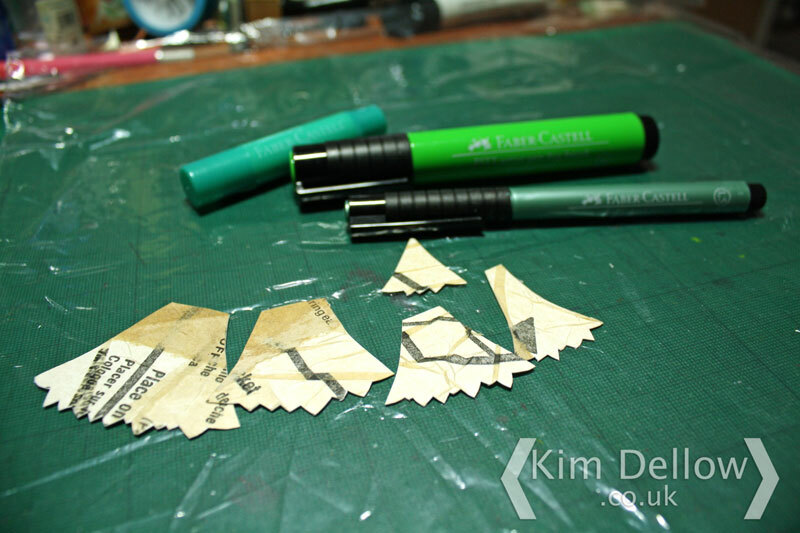 Tear the cardboard to ATC size (3.5″ x 2.5″) and remove the top layer to show the corrugations. 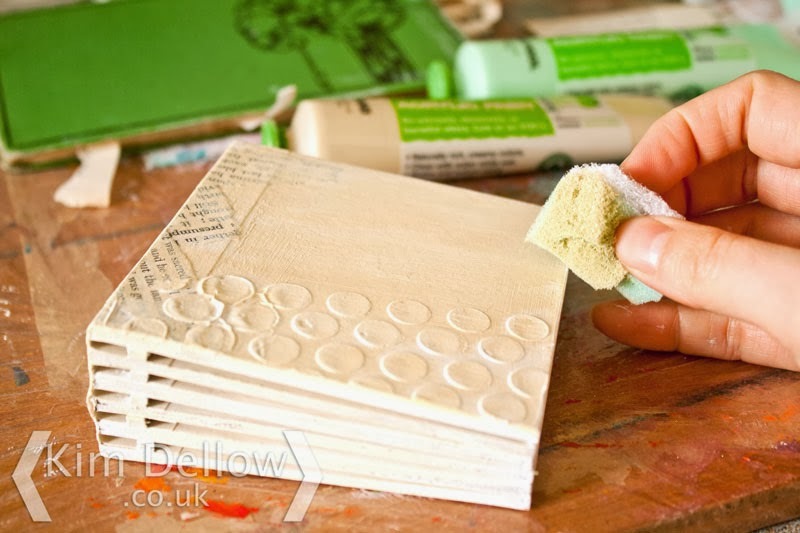 Then add a rough coating of Gesso, don’t be afraid to splodge it on unevenly. On a spare piece of white card clear emboss one of the flower stamps from the Winter Flowers Stamp set. Paint on some colour from the Lava Red Cosmic Shimmer Mist and wipe off excess mist with a cloth. 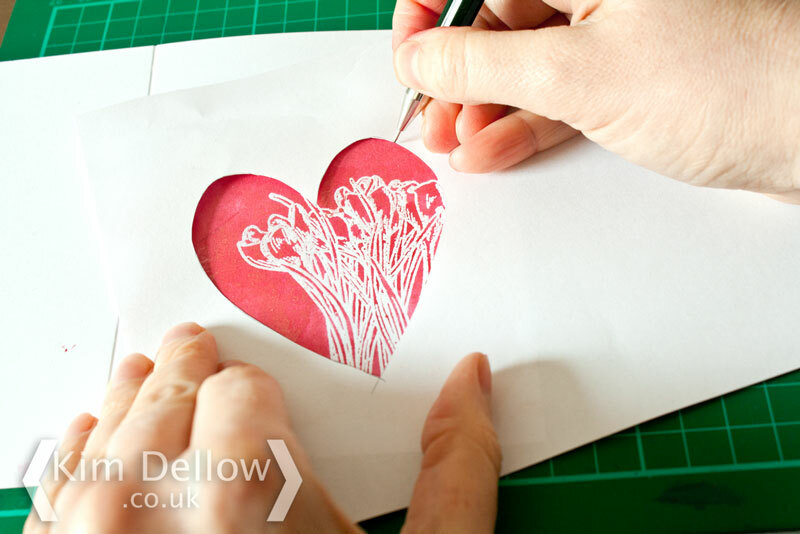 Make yourself a heart template from spare paper and draw out the heart shape over your image, then cut it out. Stamp out one of the sentiments from the Winter Flower stamp set with the Archival Jet Black ink pad and trim it to fit the ATC. 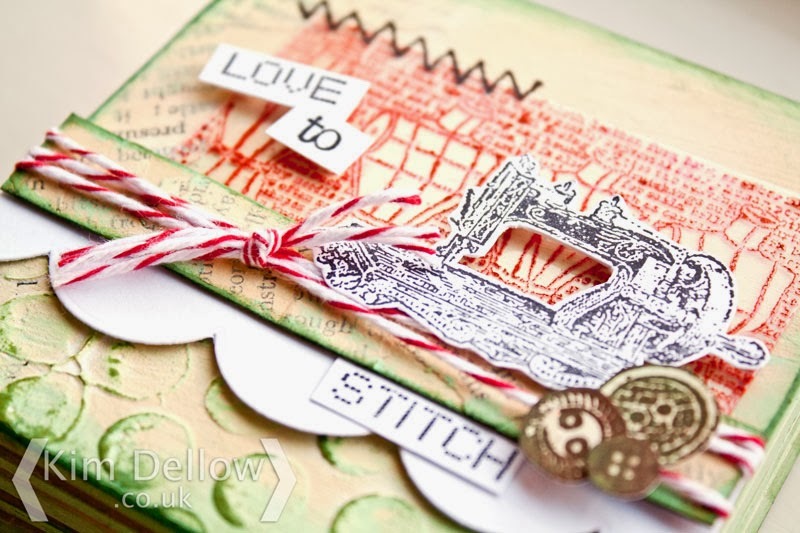 Stick the heart and sentiment to the ATC and finish with the threaded button. The Cosmic Shimmer glue works a treat, even with the button. 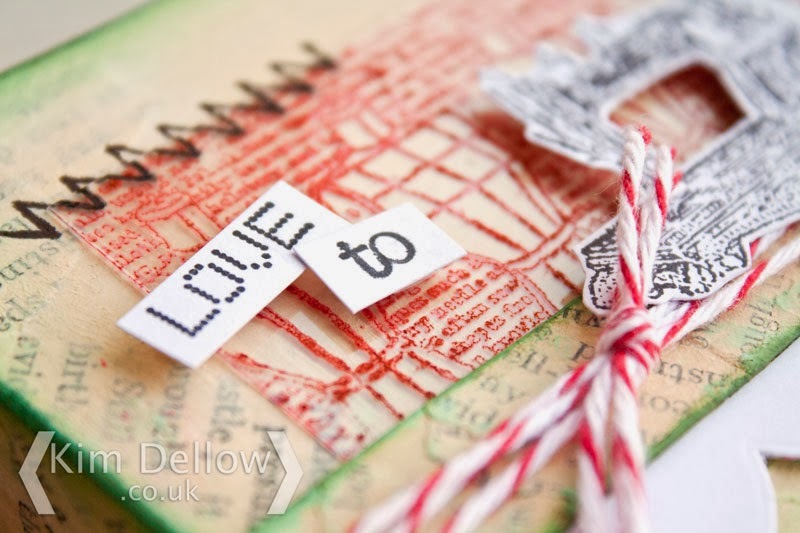 Welcome to part one of my Love To Stitch Mini Book Tutorial series. 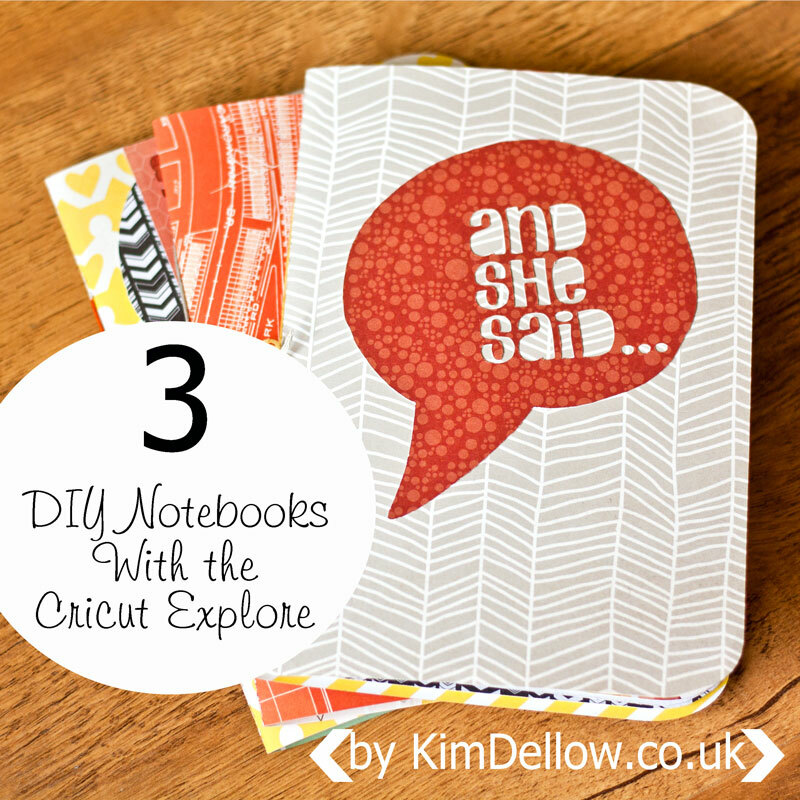 I’ve got a mini-book for Creative Expressions to share with you and as I’m working with the Umount Vintage Sewing A5 Stamp Plate I thought I might go for a sewing theme – it seemed logical! And, well, sewing does hold a special place in my heart. My mum is a stitcher, both her mum and dad were stitchers, it is just in my blood. I’m altering this mini book over the next few weeks and sharing the steps of this stitching-dedicated journal with you guys. The book is made up of six pages, so that is 12 surfaces to alter plus the spine. 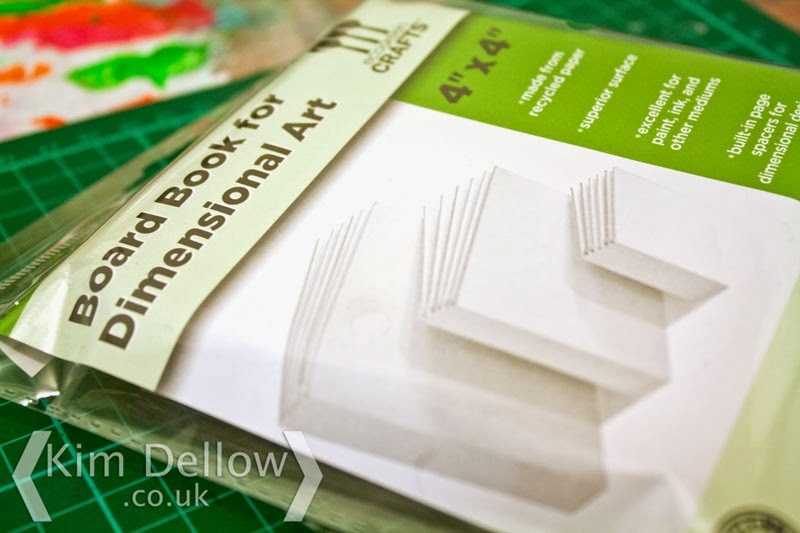 Each page is made of layers of paper to a thickness of 3 mm. 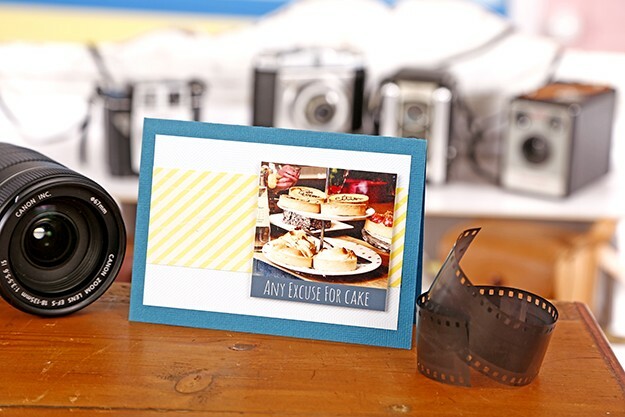 So the 4″ by 4″ book is around 3.5 cm thick and stands freely, which makes it nice and easy to photograph! (Yes, that is a jar of Marmite in the background, I’m working in the kitchen again). I started by glueing torn pieces of old book pages over the spine and part of the back and front of the cover. I also covered a strip of spare card too. Then let the glue dry completely. 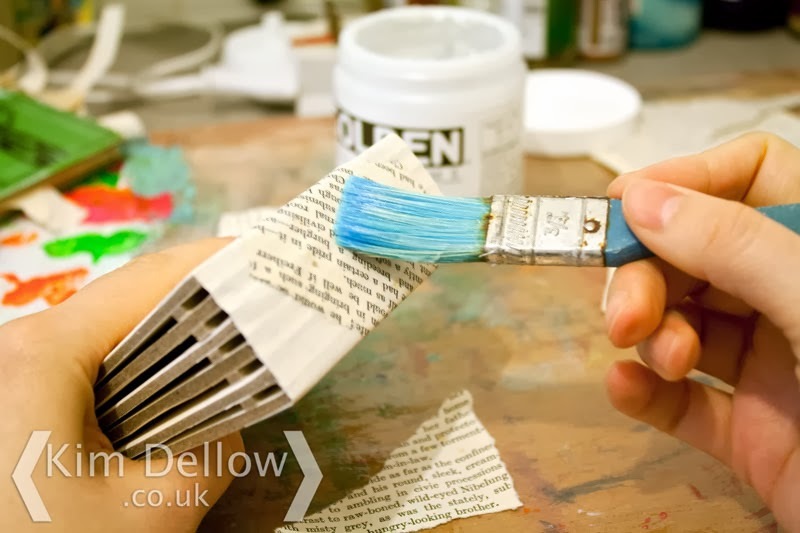 I then applied a layer of gesso to the cover, spine and sides of the book, only a light covering to blend the book page collage into the surface. Then once this layer was dry I added a thick layer of gesso through the large Polka Dot mask and let it dry completely, you can also use texture paste if you like. 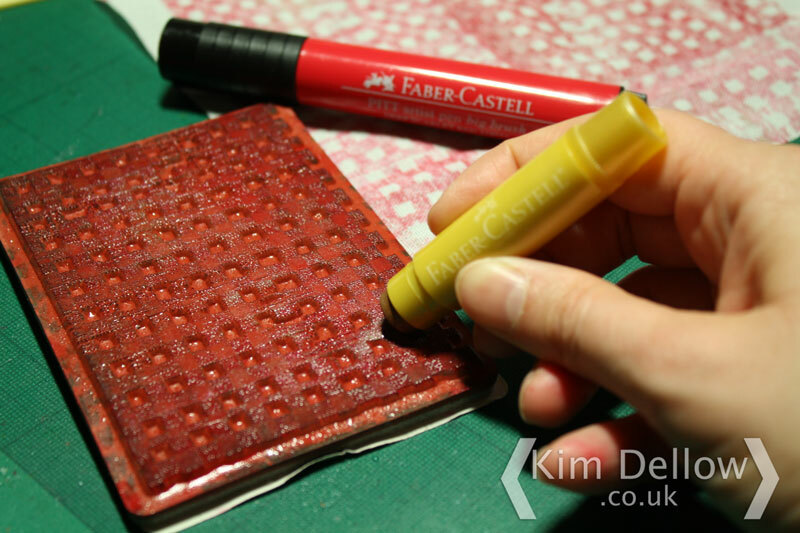 Next stage is to add a bit of colour, I added a layer of the Sand Eco-Green Crafts acrylic paint with a piece of kitchen sponge and let it dry before adding the Tide Pool paint to the outer edges. I also covered the strip of card too. 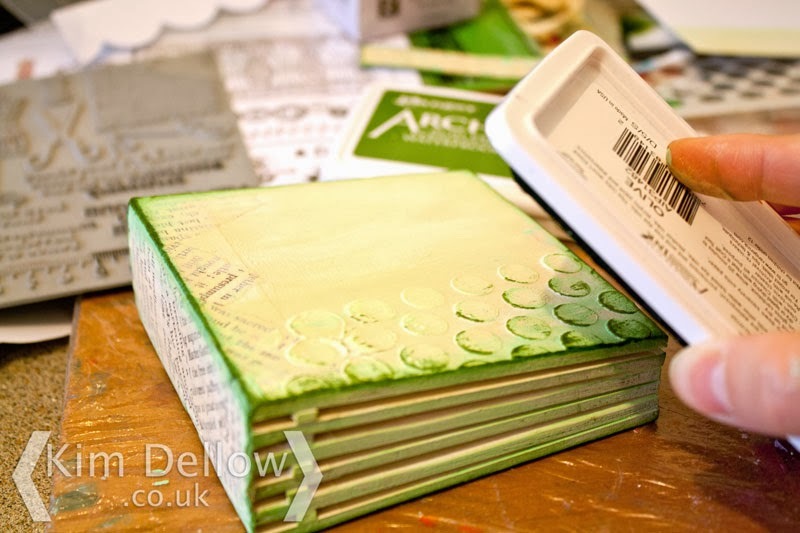 Once all the paint is dry I then brushed the Ranger Archival Olive ink pad over the edges and the gesso texture of the mini book and the strip of card too. First up, I stamped the row of dressmaker dummies with the lettering background on acetate with StazOn and cut it out to stick as the background on the front cover. I then cut a piece of white card with a scallop edge die and layered it with the old book page strip, wrapped with Baker’s twine, and stuck them to the front. 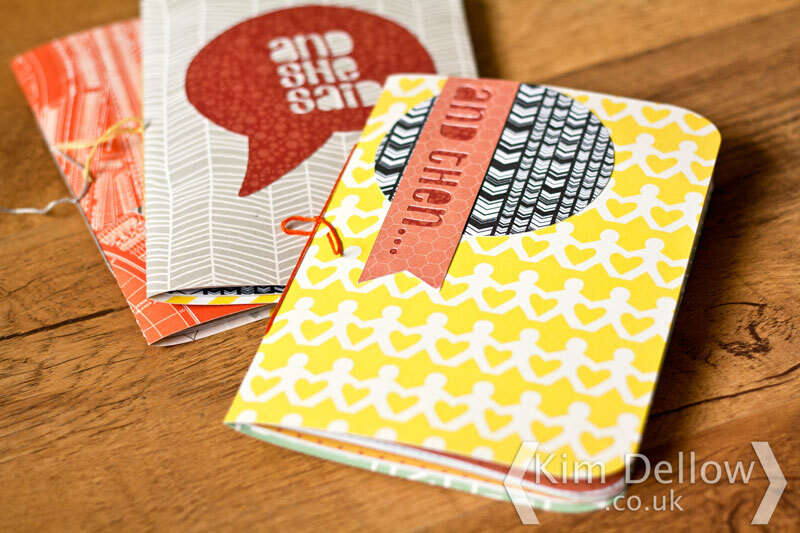 I stamped the sewing machine, buttons and sentiment, cut them out and stuck them to the front cover then finished with a touch of stitching stamped over the acetate background with StazOn and finished with a marker pen that writes on acetate. Thanks for popping by and see you next time for Part Two!